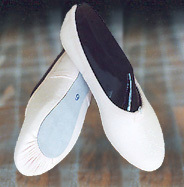 Wear ballet shoes by Verzani and feel how they cling to your feet. That is what every dancer dreams of. The secret lies in almost 20 years of experience of professionals who know all about dancing. Our special shoe-linen has advantages which leather is not able to provide. It adjusts better to your individual foot, guarantees flexibility, is hard wearing and can be dyed to any colour you want. A very important fact is that the elasticity of the linen ensures your freedom of movement. Your feet will never be sore because of the high quality of our ballet shoes. They support the metatarsal and thus improve your performance in the position "demi-pointe". 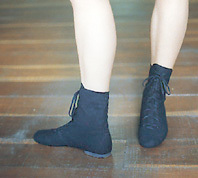 Using Verzani ballet shoes makes you feel very happy. Especially children need shoes which help to avoid posture faults and cause no pain. With Verzani every start is an easy start. You can wash Verzani ballet shoes in a washing machine as warm as 40° C. Quality and durability will be retained completely. Ask dancers who use Verzani. The advantages are confirmed in their daily work. Because your feet know what they need! For further informations like catalog, price list and special questions please contact VERZANI.